This is Lilia's story. Julie and I have been taking shifts in the 24 hour a day accompaniment of Lilia in her home a few miles from our office in the city. She is spending most of her time resting in her room after her recent surgery. Now she's sitting with me in the in main room of her small brick house in a barrio with dirt streets and many poor families side by side. "In 1998 we were living close to the military base outside of San Pablo when my husband was killed on the road on his way home. Witnesses told me the killers were dressed in paramilitary uniforms. Some of them were known to us to be members of the local police. When I went to report his death at the police station, they told me my husband had been involved with the guerillas, and that I should just be quiet and leave. When I kept looking for someone to support my case, I received threats against my four children and myself. The police finally offered to fly me and my children to another city far away for resettlement. When we arrived at the airport they wanted to put us on two small separate planes, saying it would be too much weight for one. I was hesitant, and as we were about to board our local priest arrived and persuaded me not to board. He told me later he was convinced I never would have landed in the plane. He and others worked to find secure transportation out of the area for us. That's when I came to Barrancabermeja. I learned later that the priest and other who had help us escape had also been murdered." 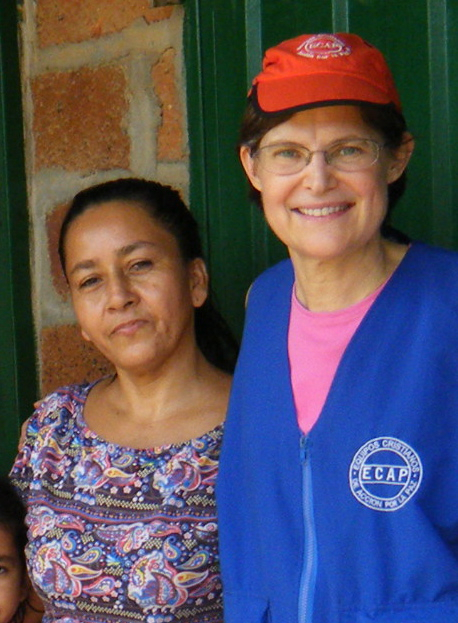 According to the Internal Displacement Monitoring Center (http://www.internal-displacement.org), the Colombian government's total of just under 4 million displaced persons since 2000 wouldn't include Lilia and her children. Still, that total is almost double the next largest group of displaced persons in the world. Lilia continues, "After we came to this barrio, I found there were many other families who had lost loved ones just as we did, and in 2004 together we founded the Regional Association of Victims. We have over a thousand members, and now I'm the president." Lilia has always known she was irritating the political status quo. She has received threats against her life, but they have appeared randomly, have been vague and were usually many months apart. Even so, she never travels alone. Lately the threats have been different. "In the last couple of years three paramilitary groups have become active in Barranca in narco-trafficing and organizing the motorcycle taxi drivers into private gangs. Paramiltaries are privatized armies funded under the table by various corporate and political groups. Those 'Moto taxistas' who refuse to join their groups are sometimes found mutilated in a remote part of town. Now human rights groups like mine and their leaders are receiving serious threats. In the last few weeks I have received over a dozen threats against me and my youngest daughter Marta, her husband, and their 5 year-old daughter. That's why Peace Brigades and CPT are staying with me. Till things calm down, I'm glad you can help"
Because of the threats, Marta and her husband have decided to sleep on Lilia's living room floor so they too have protection. There are actually four possible bedrooms in the house, but three of them are being rented out as storage space to another non-profit. This is the only regular income Lilia has. "The police come every few days to see that I'm okay, but I don't trust them. Marta and I, and the officer sign a calendar each visit to prove we were all here. I don't understand why they aren't spending more time investigating the threats. Seven of the threats came as phone calls from the same cell phone. We have given the number to the police. And a few days ago a friend of my son-in-law was killed after leaving our house in the evening. He was engaged to my son-in-law's sister. They found him with his hands tied behind his back and shot twice in the back of the head. They say his arms showed signs of torture. The newspaper reported the police saying he had been hanging around with men with previous criminal records. They are lying." On May 15, 2012 President Obama signed a new US/Colombian Free Trade Agreement, citing Colombia's improved Human Rights record. The statistics he cited contradicted his own State Department's report, as well as data collected by international organizations such as Human Rights Watch. I'd like to invite President Obama to explain his reasoning to Lilia. I'd even be glad to translate.